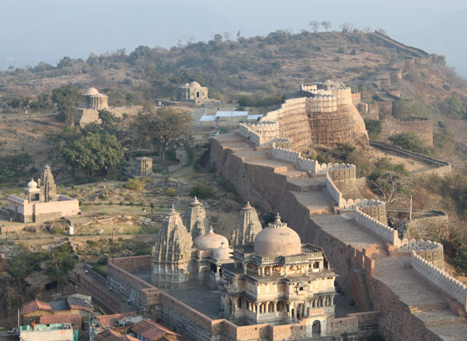 Kumbhalgarh Fort is the second most important fort of Rajasthan after Chittorgarh. Located at a distance of 84 kms from Udaipur in Rajasmand district, Kumbhalgarh Fort is easily accessible from the city of Udaipur. This unconquerable fortress is secured under the kind protection of the Aravali ranges. It is a World Heritage Site included in Hill Forts of Rajasthan. Built during the course of the 15th century by Rana Kumbha, Kumbhalgarh is also the birthplace of Maharana Pratap, the great king and warrior of Mewar. The fort that has made its mark in history as the second largest wall after the Great Wall of China – it is none but the Kumbhalgarh fort in Rajasthan. The mighty fort is 3600 ft tall and 38km long that surrounds the area of Udaipur. The fort is further declared a UNESCO World Heritage Site that is under the group Hill Forts of Rajasthan. Having witnessed a large number of wars, the hill serves as the boundary that is unbreakable. The fort that has seven fortified gateways and a number of Jain temples within it , along with the Lakhola Tank which is the most famous tank inside the fort that was constructed by Rana Lakha. The fort consists of a number of Hindu temples and Jain temples that indicate the religious tolerance of the rulers and how they patronized the Jains and encouraged their culture in the kingdom. The fort is open from 9:00AM to 6:00PM every day of every week throughout the year. The entry fee for an Indian visitor is Rs 10 while for the foreign travellers it is Rs 100.